Eyeball to eyeball - with politics! Tooth-sucking – ie slow inhalation of air through lower teeth (or, even worse, dentures) – is a very bad sign. Plumbers do it. Electricians do it. Computer geeks do it. Builders are especially prone to it. When accompanied by head-shaking and eyebrow knitting, it is a particularly bad sign, usually meaning you are going to pay – lots – in money, time, inconvenience and often all three. Here I am, sitting in a stout black steel chair fronted by all sorts of high-tech equipment, a range of which has just been addressing itself in great detail to my eyes for the last half hour or so. The kind and painstaking ophthalmologist is now consulting with the tall, grey-bearded, grave consultant.They are talking ophthalmo-speak to one another. I begin to feel very tense, apprehensive. It sounds like tooth-sucking. Oh dear. As if reading my mind, the consultant goes on: “But this condition is bilateral. It is likely to affect your right eye too, eventually.” “How long is eventually?” I wonder, feeling like a small rodent trapped in a corner by a big man wielding a broom with his back to the exit door. On to discussion of treatment options. Drops, for starters, to reduce the pressure in my left eye, at present higher than it is in the right. One type of drop, a form of beta-blocker, will “lower your heart rate, limiting your exercise capacity….” No thanks to that one, unless I get desperate and nothing else works. Rushing about everywhere on foot is my main transport mode, and I rely on that with a little light hill-walking from time to time to keep me fit. Option two, which I decide to try for starters, has a distinctly surreal dimension. Apparently it will turn my affected eye pink [questions I forgot to ask, (ii) : for how long? For ever?] and cause my eyelashes on the bad eye to grow longer and thicker. At this point I am visualising going around in a large brown paper bag with eyehole slits. Shortly after my arrival at the brown bag interim solution, the session is over. Having asked various questions, I have not been my usual forensic self in eliciting answers. Being told you are slowly advancing towards blindness, sooner or later depending on treatment, does not sharpen the mental faculties. I sit for some time with my husband, waiting for some photographs to be taken of the back of my eyeballs – partly for research purposes. I come from a family psychological matrix where one’s default position in any crisis is the worst option, always. Guide dogs and white sticks feature prominently in our conversation – or rather, my monologue. Then we walk home, having had three hours of NHS Scotland’s time, state of the art expertise, professionalism and kindness. All for free. It is a beautiful, mild autumn day, the streets rusty with fallen leaves. The verb “to see” and the noun “vision” have just taken on a new significance. It would be totally dishonest to pretend that behind the – I hope! – lightly ironic, witty tone of this article I am not rather upset both in the short and the prospective long-term, by the implications of being diagnosed with glaucoma. Insouciance would not be normal. But writers are not ‘normal’. All of us to a greater or lesser degree have a streak of psychopathy which makes every vicissitude of human experience – including our own – potential writing fodder. In the midst of my entirely appropriate angst is arising a tingle of anticipation: a new seam to be mined – and shared – has just been opened. Should I set up a new blog? What could I call it? “To the White Stick”, perhaps? Or – this is a bit more dignified, don’t you think? 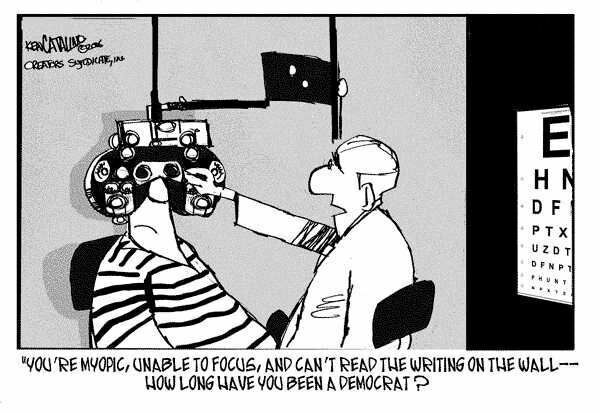 – “The Glaucoma Diaries.” I could have a sub-theme called “More bits fall off” for my popular column “Just let me get old, ok?”…….mmmm……. This entry was posted in An Appreciation of the UK's National Health Service (2) and tagged aging fashion model, beta-blocker, blindness, Computer geeks, diagnosed with glaucoma, Dracula, family psychological matrix, NHS Scotland, ophthalmologist, Tooth-sucking. Bookmark the permalink. I am pleased to report that this article was published on the Write Anything writers’ site as a Guest piece on 6 Jan 2010. Then take some time to have a browse round this varied, entertaining and inspiring site, a must-have for all writers’ Favourites! Oh dear! How are the eyeballs then? Thanks for asking! The good news is that the prescribed drops are working, the condition has been stabilised, and I have the slow-developing form of glaucoma. So I can see perfectly well, apart from one slightly blurry eye at night and/or when I’m tired. So with a bit of luck, the white stick can wait!